The modern Strat for the modern player - the culmination of the breed, if you like. Versatile tones. Modern playability. Numerous special features. Gold hardware may not suit all tastes. 60 DAYS OF STRAT: The mind boggles when one realises that the Stratocaster turns 60 this year. We said the same on its 40th and 50th anniversaries, of course, but this guitar really could have come off the drawing board six days, let alone six decades, ago. Putting it into context, that same year, Dwight Eisenhower and Winston Churchill were both still in office. 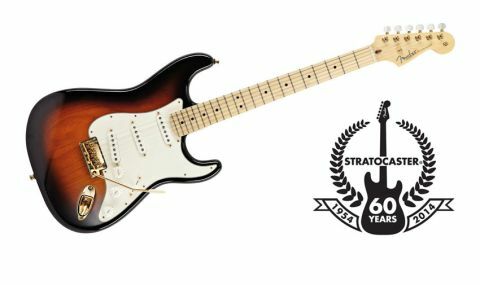 "Dressed in classic two-tone urethane 'burst over a two- piece side-jointed ash body, it brims with special features"
Available for 2014 only, the American Standard Commemorative Strat is an impressive-looking animal. Dressed in classic two-tone urethane 'burst over a two-piece side-jointed ash body, it brims with special features. It boasts an anniversary commemorative neckplate and headstock medallion and the heel is dressed away at its corner for improved access. Further aiding playability is a compound-radius 'board carrying the Standard's usual 22 medium-jumbo frets. Other high-end touches include gold hardware, pearloid tuners and pearloid dot markers. The American Standard usually features Fat 50s pickups, but here, Fender graces it with a trio of special-design 1954 single coils. They sit in a parchment pickguard with similar-coloured knobs and switch and the Standard's usual control set-up; these include the No-Load tone that acts on bridge and middle pickups. From zero to nine, it works normally, but turn it full up and it's bypassed for "increased output and overall tonal response". The Standard's neck is a slim, slinky affair that's a little wider than its two siblings, and with its compound-radius fingerboard, feels even slicker. The satin finish is drag-free, and the fat frets and low action beg for speedy licks and big bends. Fender fits it with 0.009-gauge strings that feel rather floppy - we appreciate the guitar is perhaps aimed at younger players, but surely a pro instrument should come with 0.010s? That aside, it's classy and modern, and we can think of few Strats less 'standard'. The American Standard Commemorative Stratocaster has a bright tonality. And although we kept the No-Load tone control bypassed, this was still evident on the neck pickup, which is not affected by that pot. The light strings could be something to do with it, but whatever the reason, we liked this brightness as it stacked up beautifully in our track. The American Standard Commemorative is the Strat fully formed for today: sonically, it's very versatile, and its neck, frets, dressed-away heel and compound-radius 'board mark it out as the modern-player's guitar. 60 years on, Fender should be congratulated for not only upholding the legacy of the world's most recognisable electric, but also for continuing to push the boundaries of quality and choice with this terrific guitar.